That was nine years ago. Fifteen fights and almost a full decade later, Lamonakis is still going strong. For, with a record of 10-2-3, the heavyweight has no interest in slowing down. “Heavyweight Women is not a big division,” claims the fighter, adding that it can be difficult to land professional bouts. Not that Lamonakis is sitting around waiting for the phone to ring. Besides being a Language Arts Teacher in the New York Public School system Lamonakis can also be found guiding potential fight stars of the future via “Ring Masters Champinships: Road to the Garden,” a highly touted amateur competition that boasted of “600 applicants in 2018” and where participants “received a belt if they won their division.” No small thing in amateur boxing, especially for a competition its size. “We are extremely busy,” Lamonakis says. This year’s winners, who will emerge via a brackets system (such as the kind employed the NCAA basketball tournament), “will move on as a team to the National Golden Gloves,” which is the crème de la crème of the amateur scene. “We’re going to have 20 shows,” states Lamonakis. 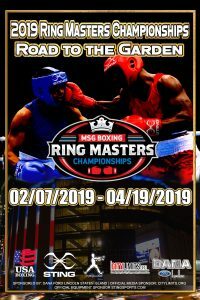 And, as Ring Masters Championships makes clear, the “senior finals will be held at Madison Square Garden April 19, 2019,” where the top competitors will face off in boxing’s (and perhaps the world’s) most famous arena. Although her schedule is undoubtedly busy, Lamonakis makes sure to find the time to do what she clearly loves. “The good thing about being a school teacher,” she says, “means I’m out about 3:30,” each afternoon. “I never expected what I found,” she says, speaking of her entrance into the boxing world all those years ago, “the smell of the sweat, the ring of the bells.” Enticing stuff…the sort of stuff Lamonakis hopes will continue to entice young competitors as Ring Masters Champions continues making its mark on the amateur boxing scene.